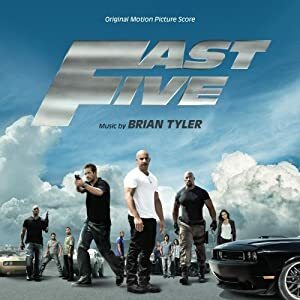 Win FAST FIVE by BRIAN TYLER - RevYou! Your Own Soundtrack Review to Win! AND FOR YOUR NEXT OPPORTUNITY TO ENTER! Let's face it. Most of us who love film, tv, and video game music have pretty strong opinions on it. How many times have you read a review here at Tracksounds or elsewhere, where you said, "I just don't agree with this!" or "I could write a better review than this!" Right. Probably a few times. Well, here's your chance to show 'em how it's done! Not only do you have an open platform to express your opinion and writing skills, but you could actually win official soundtrack releases for your efforts! How good is that? Just visit our select review pages below, go to the Disqus comments section at the bottom and post your review! (Make sure you read and understand all of the rules [below] before you do. Write a review of at least one of the select soundtrack titles of the month. Must be at least 200 words in length. You can write one review per select title. Submit your review on the page in the Disqus comment section. Let your peeps know about your review and get them to “Like” it using the "like" button for your comment-review. Write the review will be selected by the Tracksounds review team. Winners will be chosen based on their reviews creativity, perspective and detail. Physical CD prizes are only available to US Residents. Digital prizes will be available internationally. Make sure your peeps click the correct LIKE link! Two entrants per contest period (per month) will win. No reviews submitted or "likes" received after the closing date and time will be counted. If the winner by chosen by the Tracksounds review staff also happens to have the most “likes” that month, then the review with the second most Likes will be the second winner. In the event of a tie for most “likes” a coin toss will determine the final winner. Any fraudulent or apparent fraudulent entries will be disqualified and removed. Any suspicious activity regarding the quantity of "likes" a comment-review receives will be subject to review, possible disqualification and permanent banning from future contest participation. Composer Brian Tyler is back with another fuel-injected turbo-charged score.